On Oct 17, 2018 at 12:30pm prof. Enrico Masala will give a talk at the DAUIN lunch seminar event series, which are held every third Wednesday of every month and are open to the public inside and outside the university. 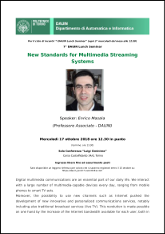 The title of the seminar is “New Standards for Multimedia Streaming Systems”. The seminar will be held in Italian at the Conference Room “Luigi Ciminiera”, in the Control and Computer Engineering Department, Corso flier Castelfidardo 34/D, Torino. More information available here and here.